I hope everyone had a wonderful Thanksgiving! Mine was full of delicious food, lots of family, a cat nap or two, and fun board games. And now, time to break out the Christmas music!!! 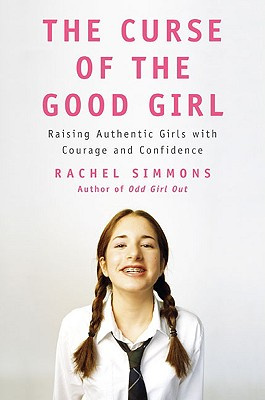 The very first book review I published on this blog was for Rachel Simmons's The Curse of the Good Girl almost three years ago. (Spoiler: I really liked it!) I just recently read this article on how being a "good girl" - i.e., one who doesn't rock the boat or make waves, one who is always nice and polite and doesn't speak up for herself even when she feels something is wrong - can be a literal health hazard. We’re told to be polite, be good, to not interrupt, to say thank you and fake appreciation even when we don’t like something, to be pleasant, not make waves, to be seen and not heard, to not question authority, not stand up for our rights, not be bossy, share when we don’t want to – the list of how we’re taught to “be good” is endless. I’m not saying we shouldn’t be decent citizens with good manners, but that’s different than not speaking up for ourselves and accepting what just feels wrong. But at the same time, I have been frustrated by feeling steamrolled both for my own medical care and that of my children. For the most part we've had great medical and dental providers, but there have been a few I've had to face down occasionally and a handful we've refused to see again. How about you? The plight of Syrian refugees continues to tug at my heartstrings. This article from Public Radio International lists several organizations doing important work specifically to help these refugees. Love, love, love this article about history's complications. People are complex - never all good or all bad - and the decisions they make are complex, even when - perhaps especially when - they are in a powerful position. The article focuses on a current controversy at Princeton University regarding Woodrow Wilson. Wilson, as you may know from your history classes...was both a Princeton alum and the university’s president before he went on to become the governor of New Jersey and, in 1912, only the second Democrat since Reconstruction to win the White House. He led the country through the First World War, founded the League of Nations and established the Federal Reserve system as we know it, among other things. What you might not have known about Wilson — and I admit, this was hazy in my memory as well — is just how execrable a human being he seems to have been. Wilson was a fervent segregationist who apparently went to some effort to separate the races in federal buildings. As president, he screened “Birth of a Nation,” the infamous film glorifying the Ku Klux Klan and its philosophy, at the White House. So President Wilson had some great accomplishments and was an avowed racist who used his considerable influence to block racial progress. People are not all good or all bad. ...today’s students have grown up in a society that increasingly eschews moral complexity...But history is complicated, and so are the people who make it. The messy reality is that great people sometimes do terrible things, and terrible people sometimes do great things. To discard all the actors we find abhorrent, along with all the things they might have accomplished, is to deny the vexing contradictions of humanity — which is exactly what real knowledge is about. It's a fair question, however, to ask how we should recognize and honor the "good" without either ignoring or praising the "bad". I appreciate this author's nuanced approach and suggestions on how to teach this up-and-coming generation how better to handle the moral complexities and shades of gray inherent in being human, while always striving for personal improvement.